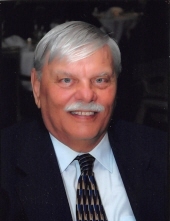 David J. Cratchy, 74, of North Fond du Lac, died Thursday March 28, 2019, at St. Agnes Hospital, due to complications from kidney disease and cancer. Dave was born March 18, 1945, a son of John and Adeline (Boelke) Cratchy. He was a lifelong resident of North Fond du Lac. He married Carol J. Druggish on April 18, 1970. Dave worked at Mercury Marine from 1971 until his retirement in 2007. Dave enjoyed hunting and fishing, especially fishing on Lake Erie and Lake Winnebago, family camping at Pearl Lake Campsites and was an avid Packer and Brewer fan. He was an active member of the Fraternal Order of Eagles Aerie #270, Fond du Lac for over 30 years, and the Eagles Anglers. He enjoyed preparing the potato pancakes at the Anglers breakfasts during Lent, and the Kid's Fishing Outing held on Father's Day. Dave, along with Daniel Thurke and Marlyn Glass started the Fond du Lac Chapter of the Rocky Mountain Elk Foundation in 1984. He served in the US Air Force and was a veteran of the Vietnam War. Dave is survived by his wife of 48 years, Carol, two sons, Chip (Sandra) of Fond du Lac and Donald of Stewartville, MN, five grandchildren; Casey, Emily (special friend Nicholas Kimpel), Courtney all of Fond du Lac and Madelyn and Samantha of Stewartville, MN, 4 great-grandchildren including Rhett Kimpel born on Dave's birthday this year. He is further survived by a brother, James A. (Cheryl) Cratchy, North Fond du Lac, brother-in-law, Larry I. Rupert, Iola, WI, sister-in-law, Diane (Roger) Balthazor of Bella Vista, AR, and a sister-in-law, Eileen Druggish, Boulder, CO, nieces and nephews, Jeanne (Clarence) Gorter, Steve (Linda) Rupert, Debbie (Michael) Jacquart, Malissa (Scott) Bonlender, Linda (Ken) Sadorf, Steve (Tracy) Balthazor. He was preceded in death by his parents, a sister Carol J. Rupert; his in-laws, Ralph and Mae Druggish, and a brother-in-law, Thomas R. Druggish. Visitation will be held on Sunday, March 31, 2019, from 2-5 PM at Uecker-Witt Funeral Home, 524 N. Park Ave, Fond du Lac, WI, 54935. Military honors will take place at the funeral home at 5:00 PM. Cremation will follow. To send flowers or a remembrance gift to the family of David J. Cratchy, please visit our Tribute Store. "Email Address" would like to share the life celebration of David J. Cratchy. Click on the "link" to go to share a favorite memory or leave a condolence message for the family.